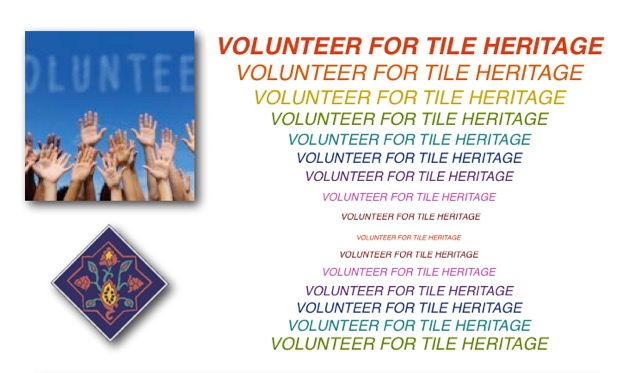 Volunteers are a vital force at Tile Heritage . . .
. . . and there are many VOLUNTEER OPPORTUNITIES! Together every year volunteers contribute hundreds of hours of their time. And we can really use YOUR help as well! Some volunteer tasks are ‘on location’ at the THF Archives & Library in Healdsburg, CA and other tasks are accomplished via techno-connection as well as in different venues across the country….. some volunteering involves one-time events and others involve longer term commitments to ongoing projects. There are tasks that require technical skills as well as jobs that require no previous experience. CLICK! full details and sign up on-line to volunteer . . .